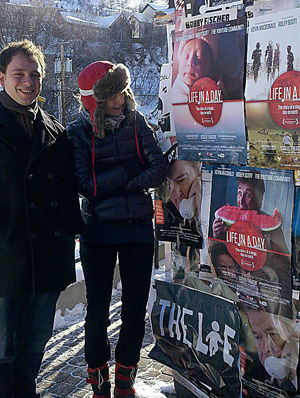 Last night, Life in a Day premiered at the Sundance Film Festival and was live streamed on YouTube. Along with over 80,000 other people, I submitted a video I shot on July 24th, 2010. That happened to be the birth of our daughter, Anna. I was excited to receive an email a few months ago letting me know that one of my video clips was going to be used in the film. Unfortunately, since the editors wanted to keep the content of the film under wraps until the film launched, I wasn’t able to share the news of our selection. My wife and I sat down last night with our six month old daughter and watched the film stream on YouTube. About a third of the way through, we saw the clip of my wife and daughter at the hospital. We were certainly excited to be a part of such an original film, however short it may have been. Earlier this week, I logged onto YouTube and saw a banner advertising the upcoming live stream of Life in a Day was surprised to see my daughter’s face on that banner. A little while later, YouTube tweeted a picture of some posters for Life in a Day hanging outside of Sundance in Utah and again I saw her face on one of them. I contacted Life in a Day and asked them to send me a copy the poster and they were kind enough to oblige. 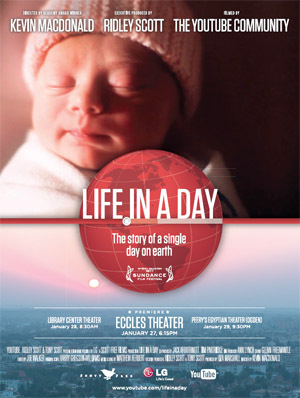 It was very humbling to see an image of our daughter used to represent a film about the day in the life of the entire world. I commend the director, editors, producers and all the filmmakers who made such a great film happen. As for my film, it was simply the day through my eyes. Our daughter was born at 2:37AM, nearly 26 hours after my wife’s water had broken. 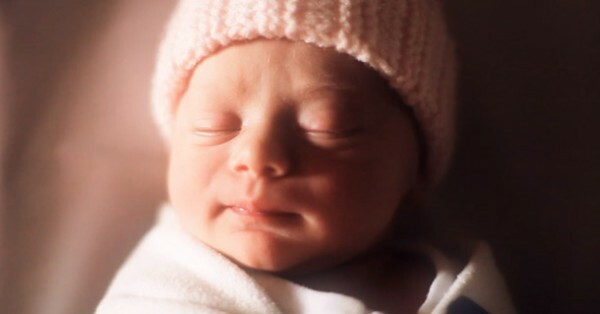 We all expected her to be born on the 23rd, but Anna held out until the 24th to share her story with the world. We finally got some sleep around 6AM, but only for a few hours. As the sun rose, I continued to document the day. Family and friends visited and we napped in between. My wife and I began to bond with our daughter and slowly discover her personality. Finally the day came to a close and we said goodnight. It was a wonderful day and one I’m glad I documented for this film and for her. Congratulations! Also very nice cinematography there. Coz the image looks really amazing and I’m just wondering if you just used available lights in the room. Thanks. For some of the scenes I moved lights around the room to get the angle I wanted. Otherwise it was just using natural light. OHHHH!! I saw this. I was gong to contact you about it, but obviously you know. What a great premiere huh? Congratulations Tony. I wish I had submitted something to it. Beautiful! Can you tell us what you were using? 5D I’m guessing. Lens? Shoulder rig?